Chances are, the word biodiversity makes you do one of two things: either immediately glaze over in a cloud of vague buzzword understanding, or call to mind far-flung exotic locations teeming with rare plants and animals that have little or nothing in common with what’s in your backyard. For whatever reason, whether it be the subtle powers of pop culture or the late-’80s explosion of “save the rainforest” sentiments, popular opinion has long associated biodiversity with pristine tropical destinations. Now, however, in the age of melting ice caps and the proliferation of endangered species, biodiversity has become a catch-all term for measuring the health of a particular habitat and, thus, justifying the preservation of said habitat. 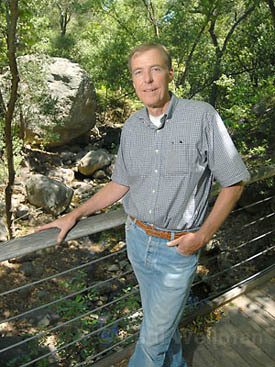 Robert Muller, director of research at the Santa Barbara Botanic Garden, is one of the organizers behind the first-ever Santa Barbara BioBlitz. The event, which will take place in and around the Mission Creek portion of the garden's property, aims to identify as many living things as possible in one 24-hour period. This weekend, in the hope of answering these sorts of questions, a team of 17 scientists from throughout the state-each an expert in his or her respective field of study-will meet in the upper portions of the SBBG. For 24 straight hours they will scour a 15-acre area along the banks of Mission Creek, trying to identify as many species of flora and fauna as possible. From the garden’s upper meadow down through the redwoods, across the creek and up to Tunnel Road, they will sift the dirt for mushrooms, crawl through the bushes for flowers, capture insects, look for birds, hunt for bats, study snails, and track down raccoons all as part of Santa Barbara’s first-ever BioBlitz. And, thanks to the relatively unimpacted state of the study area, when the smoke clears Saturday afternoon, an actual real-time picture of just how biodiverse Santa Barbara is will emerge. Simply put, the buzzword will be replaced by an actual number. To that end, Johnson and her staff have brought in experts, many of them local, in a wide range of fields-from mosses and ferns to slugs and spiders. The team’s members will take to the rich riparian corridor that surrounds Mission Creek and showcase their individual talents in the hunt for species. Not only will the study help paint a picture of what lives in the native SBBG landscape, but it will also serve as a helpful indicator of just how healthy downstream areas -i.e., more urban-may or may not be. It is the latter that has perhaps the most significance for the community at large as it will provide a helpful context for the research already being done by the likes of the city’s Creek Council and nonprofits such as Santa Barbara Channelkeeper and Heal the Ocean. Though the Santa Barbara BioBlitz marks only the second time such an event has ever taken place in California (there was one in Cupertino in 2002), it is just the latest in a long line of similar earth-friendly events. The first-ever BioBlitz was held at one of literature’s most famously depicted habitats, Walden Pond in Massachusetts, back in 1996. Organized by renowned environmentalist and celebrated Harvard biologist E.O. Wilson, that modest first BioBlitz proved to be such an enjoyable and scientifically accessible event that, in the 11 years since, it has been repeated countless times around the world. From western Australia to western Illinois, literally thousands of scientists, both amateur and award-winning, have taken to creek beds and forests, deserts and shorelines, to count the many critters-big and small-that call them home. Each time, the results have been impressive, with new species discovered, disturbing trends identified, habitats protected, and untold numbers of children-young and old-turned on to the magic of science. Most recently, the end of April saw the first-ever international blogger BioBlitz, wherein hundreds of bloggers from around the world shared the results of their own personal blitzes in conjunction with the National Wildlife Federation’s Biodiversity Days. There has even been the unintentional emergence of a bragging competition among BioBlitz sites in which they try to outdo one another in the number of species identified. To date, the unofficial record-setter took place in Danbury, Connecticut, in 2001 when 2,519 different species of living organisms were counted-a record some feel could be in jeopardy come this weekend’s count. However, to Wilson, who is also credited with coining the phrase “biodiversity,” and those organizing Santa Barbara’s BioBlitz, these day-long data gathering adventures are so much more than just an exercise in counting: They are a perfect way to call public attention to the vast and varied types of life thriving in our respective backyards. By inviting the pubic to join-which the SBBG is doing-a BioBlitz can offer first-hand evidence of the vibrant, and all-too fragile, web of life that not only surrounds us but also provides the foundation for our existence. With this unique educational opportunity in mind, Johnson and company consciously designed the SBBG BioBlitz to be more than just an exercise in data collecting. Besides being able to watch all kinds of “-ologists” in action, there also will be opportunities for folks to join in on the survey teams and actually get their hands dirty. And, if the idea of hunting blister beetles or stinky monkey flowers doesn’t appeal to you, the BioBlitz is also offering a full lineup of educational films, slideshows, and presentations from favorite resident scientific luminaries like Bob Hallar, Bob Cummings, and Larry Friesen. Furthermore, portions of the SBBG that aren’t being blitzed will host several interactive and informational booths complete with arts and crafts, microscopes, and a perfectly disgusting water-filled horse trough, which, Muller was keen to observe, “are famous for being home to all sorts of neat things.” Muller continued: “For this to work, it really needs to meld a scientifically valid undertaking with a fun, public event.” And, as if that weren’t enough, MTD is offering free bus fare on Line 22 for all those headed out to the BioBlitz. California has long been heralded as the most biodiverse state in the U.S. and the Santa Barbara region often gets even higher billing, frequently called a biodiversity “hot spot” of global proportions. As Muller explained, “About a quarter of all the plants that grow in California, whether they be native or exotic, grow specifically in Santa Barbara and I think the same is true for most other species.” Crunching those numbers suggests that, since California is home to some 6,000 plants, an S.B. BioBlitz could potentially identify as many as 1,500 plants alone-a number that would go a long way toward breaking the Connecticut record. Lamenting the fact that the SBBG BioBlitz won’t have a worm or soil expert on hand, and the fact that the lack of rain will greatly reduce the mushroom count, Muller reckoned it will be difficult for this year’s event to reach such lofty numbers. That being said, he remains hopeful for some pleasant surprises and scientific drama once the counting commences. “It is very possible a new species will be found and I definitely wouldn’t rule out a few ‘Oh, wow! That’s in Santa Barbara?’-type discoveries,” contended Muller. Though there is sure to be much pomp and circumstance at 4 p.m. on Saturday when the BioBlitz concludes and the final tally is announced, the lasting value of the event won’t be a number. It will be the peace of mind that, from here on out, no matter what happens, there will be an actual account of just what types of living things-big, small, or microscopic-were calling the upper stretches of Mission Creek home in early May 2007. And for a town that famously claims to have invented Earth Day, this is one long-overdue development. After all, what good is biodiversity if you don’t even know what it means? On Saturday, May 12, from 10 a.m. to 4 p.m. the public is welcome to observe and learn about the diversity of life that surrounds us in Santa Barbara’s BioBlitz. There will be displays of plants and animals, and educational opportunities for both children and adults, including demonstrations and hands-on activities. There will also be lectures and tours, specimen preparation, and computer simulations of ecosystem dynamics, or food web interactions. Visit bioblitzsb.org for more info. 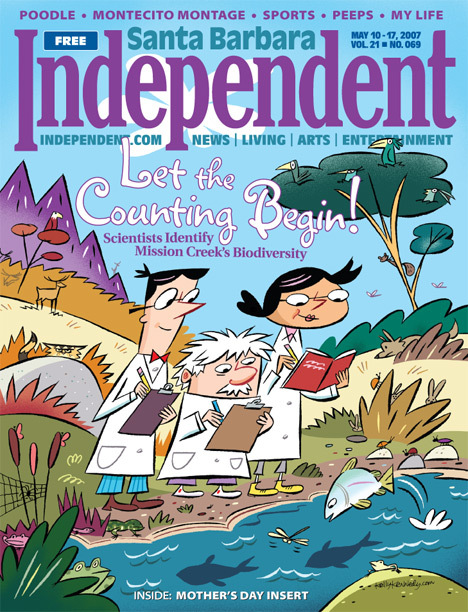 To enter The Indy‘s own BioBlitz contest by counting how many creatures you can find on the cover of this week’s paper, go here.